You are here: Home › Types of Cover Crops › Annual Ryegrass › Cover Crop Benefits › Cover Crops effect on spring Soil temperatures › Cover Crop Challenges › Misinformation and Myths › Stand Establishment Following Cover Crops › Timing of Planting › Do Cover Crops Keep the Soil Colder in the Spring? This is a question I get over and over again. And most of the time it’s not really a question. It’s actually someone stating to me why they are not going to plant cover crops. But is it really true that a surviving cover crop will keep my soil colder than a conventionally tilled soil? Several years ago in March I stopped at a cover crop test plot on the Indiana/Ohio border. 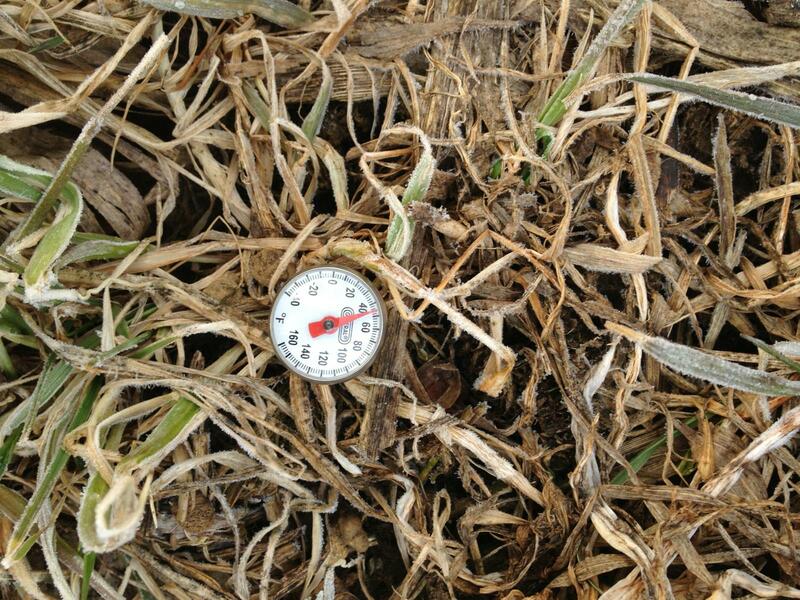 While I was there I checked the soil temperature where cover crops had survived (Annual Ryegrass and Winter Cereal Rye) to see if it was indeed colder than the tilled soil that surrounded the plot. What I found was a bit surprising considering the conventional “widsom” I commonly heard. The soil temperature at 4″ depth was warmer by 1-2 degrees where we had a surviving cover crop than in moldboard plowed dark soil. I sampled on a sunny day when the temperatures were in the 40’s. Since then I have taken comparative soil temperatures in many locations where no-till was done, where there was no-till with cover crops, and where there was fall tilled soil. In nearly every instance the area where there was a cover crop the soil temperatures were equal to or above the fall tilled soil temperatures. Each of these samples were just taken one time – a snapshot test in time. This spring my brother Don Robison is taking soil temperatures and photos of a soil thermometer from our home farm near Greenwood, IN. He started taking these photos on March 29, 2013. The plan is that Don will take soil temperatures for four or five consecutive Fridays – in annual ryegrass, in no-till soil (that has some winter annuals present), and in fall tilled soil. And since March of 2013 has been quite cold when compared to recent years, the results should be interesting. Each week I will post the temperatures as Don send them to me. Below you can see the temperatures from March 29. Be sure to check back weekly for the results. Send me temperature readings and photos (phone camera quality is fine) and I’ll compile some data from different parts of the country (world) and pass the data along. 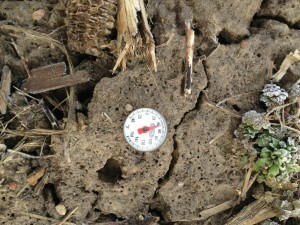 Please let me know your soil types and general weather conditions when you send in your reports. 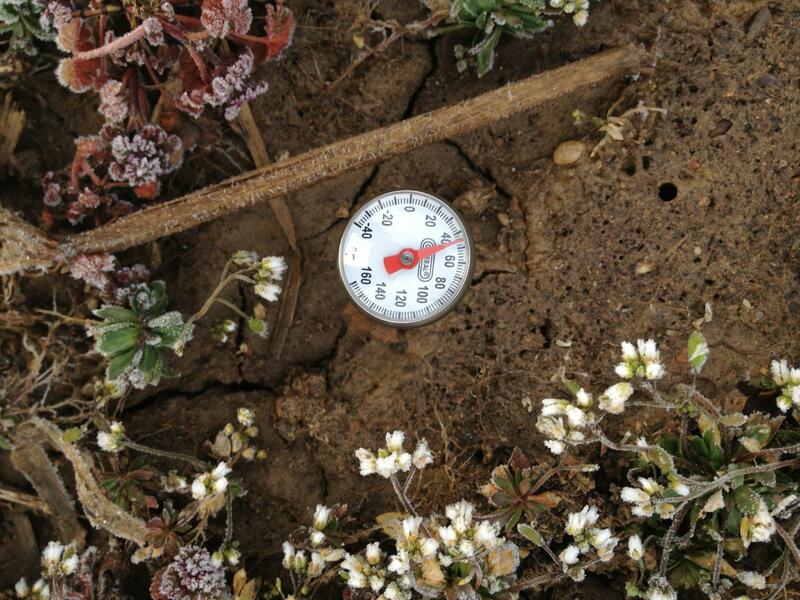 The soil temperature on March 29, 2013 at approximately 4 inches in fall tilled soil. 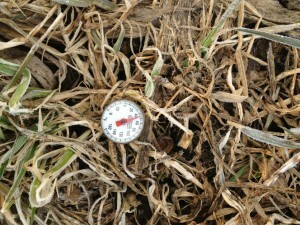 The soil temperature on March 29, 2013 at approximately 4 inches in an annual ryegrass cover crop. The soil temperature reading on March 29, 2013 at approximately 4 inches in no-till soil.